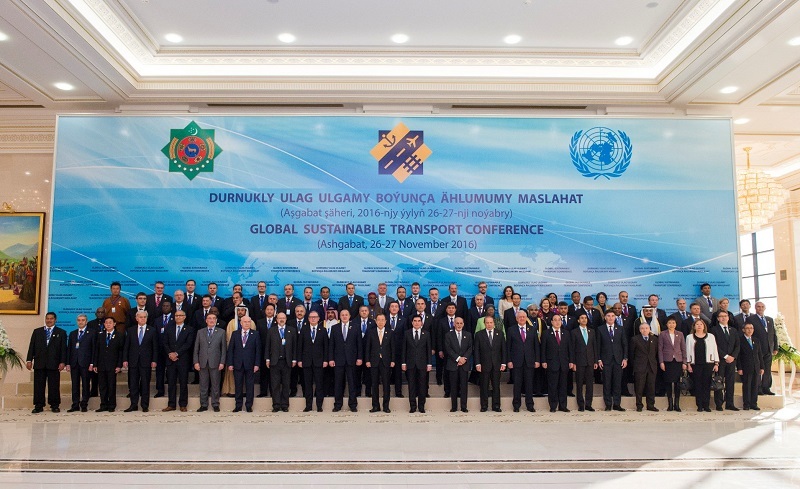 The Global Sustainable Transport Conference took place for the first time ever in Ashgabat in Turkmenistan from 26 – 27 November 2016. UIC was represented by Director General, Jean-Pierre Loubinoux, and Nick Craven, Head of the Sustainable Unit. This event was the occasion to reinforce the role of the High Level Advisory Group on Sustainable Transport and discuss the implementation of the 2030 Agenda and the Sustainable Development Goals. More than a thousand key stakeholders attended the event including three Heads of State, one Head of Government, six Deputy Prime Ministers, two Foreign Ministers, 42 Ministers and Vice-Ministers of transport and infrastructure. Some 200 business and civil society representatives, along with representatives of over 20 intergovernmental organisations and the UN entities participated in the event. The United Nations Secretary General, Ban Ki-Moon launched the event and acknowledged that the high level group had highlighted best practices in its report. He stressed that “we need to stop business as usual”, that “without action on transport we will not be able to limit global warming”. He also recognised that “it takes investment to see results; it takes mobilising funds from a variety of sources”. He emphasised that it was time for action – in the follow up of COP23, described as the COP for action. Mr Craven moderated the business summit session on transit corridors. UIC co-organised the first ever side event of this first global conference on sustainable transport with UITP. The topic was rail and public transport delivering the sustainable development goals. The event was particularly attended by railway CEOs. UIC contributed to the workshop on sustainable transport indicators organised by the World Bank and hosted by the Ministry of Roads from Turkmenistan. Regarding the railway sector in the region, UIC applauded the final rails that have been laid for the first phase of the Asian International Railroad Track. On 30 October 2016 Turkmenistan installed the finishing rail tracks at Akina Station at the terminal point of the Turkmen-Afghan railway. The conference concluded on Sunday and 50 countries endorsed the “Ashgabat Statement on Commitments and Policy Recommendations”. All national governments delivered statements on sustainable transport. Together these statements made a compelling case for sustainable transport to be considered as a priority by the incoming secretary general of the United Nations António Guterres.